Beach combing is one of our favorite pastimes. We spend hours walking along the tide line searching for treasures. Shells are the main attraction, but we also enjoy finding items that have been lost or discarded at sea. The second category includes a fair amount of plain old junk, but there are also useful things such as lengths of rope, fishing floats, and rapalas (fishing lures). Getting back to the main attraction, the shells, the vast majority of finds on any given beach are either damaged or uninspiring. As soon as a shell washes ashore, the sun and the surf begin their work bleaching and grinding away. It is rare and exciting to find an intact shell with good color and a nice shiny surface. In all of our hunting, we have found nearly perfect examples of many different types of shells. However, one shell has eluded us. Despite frequent searching, we had yet to find a paper nautilus. We first learned of the paper nautilus last summer from Laura on Just a Minute. Laura explained that the shell is created by a species of octopus (the Argonaut) and its purpose is to protect the animal’s eggs. During the full moon, the eggs hatch or something similar takes place and the shell is released. 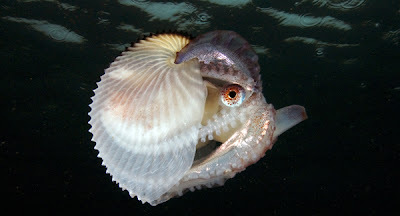 The following morning is the best time to go paper nautilus hunting. Getting an early start is important. As ‘paper’ implies, the shell is very delicate and if the shore birds find it first, it will likely be picked apart. The last full moon was on Saturday, January 26. First thing Sunday morning Trisha and I jumped in the dinghy and headed for the beach. We walked and searched for a couple of hours but had no luck. We had given up for the day and were about fifty yards from the dinghy when I spotted a white shape in the sand near the waters edge. I called Trisha over and she screamed when she saw it. We got our paper nautilus. This is Derrick's best beach find yet!